The opening of the exhibition Making Art Concrete: Works from Argentina and Brazil in the Colección Patricia Phelps de Cisneros marks an important moment in the years-long research project that preceded it. 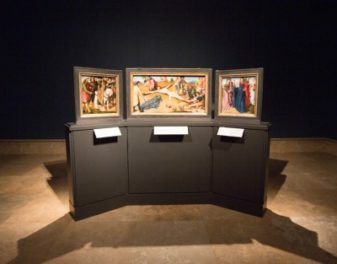 Beginning in 2015, my colleagues and I at the Getty Conservation Institute had the unique opportunity to conduct the first-ever technical examination of 46 Concrete artworks from Argentina and Brazil on loan from the Colección Patricia Phelps de Cisneros. The exhibition and accompanying catalog present technical aspects of a selection of these works, from information on the many unusual support constructions to the artists’ painting materials and techniques. For works of art, the UV examination process involves positioning an ultraviolet lamp in front of the surface of a work in a dark room. A few artists’ materials, depending on their chemical structure and condition, will briefly absorb ultraviolet radiation and then reflect some of this energy in visible light wavelengths (i.e., fluoresce). Most substances actually do not fluoresce, but many of the compounds that do fluoresce are organic and appear in paintings, such as aged linseed oil and natural resin varnishes. Generally speaking, the older the oil paint or varnish, the stronger its greenish fluorescence under UV. This characteristic green fluorescence can be observed in Concreto 37, a work by Judith Lauand from 1956, for which the artist chose an alkyd-based paint, found in many Brazilian Concrete works from this period (images above). Alkyds are a form of polyester resin combined with drying oil, in this case with the addition of pine resin. Areas in which the white background paint was applied more densely appear as roughly circular forms under UV. The strong fluorescence witnessed in this work can be attributed to the presence of aged drying oil and resin. A number of pigments are also known to fluoresce, such as genuine madder lake, which is found in Old Master paintings, and zinc white, which was widely used by Concrete artists in Latin America (for example in Concreto 37). But since binders and pigments are almost always encountered in a matrix and often in layers, rather than separately, it can be difficult to correctly assess the intensity and color of their fluorescence or absence thereof. For example, earth pigments in linseed oil, the most common binder in tube oil paints, have an inhibiting effect on the development of fluorescence and yellowing, whereas white lead and cobalt blue have a stimulating effect. (3) Apart from zinc white, the other main white pigment identified in the works in our study is titanium white, which neither inhibits nor enhances fluorescence, while zinc white by itself fluoresces pinkish or yellowish-green, depending on the exact UV light source and the kinds of impurities and extenders present. The ultraviolet region of the electromagnetic spectrum lies just past the blue end of the visible spectrum, at 400nm, which means that ultraviolet radiation has shorter wavelengths than visible light, which is in the region of 400 to 700nm. At the other end of the electromagnetic spectrum is infrared, a region that extends from 700nm to 1mm. Since some pigments become transparent in the infrared region, but other materials do not—for example, carbon-based underdrawings— pentimenti (compositional changes) and faded or obscured inscriptions can often be detected. Left: Alternado 2, 1957, Hermelindo Fiaminghi (Brazilian, 1920–2004). Alkyd on hardboard, 61.9 × 62 × 4.5 cm (framed). New York, The Museum of Modern Art. Promised gift of Patricia Phelps de Cisneros through the Latin American and Caribbean Fund in honor of Catalina Cisneros-Santiago. Right: Detail of bottom left corner of Alternado 2 in infrared light: earlier signature visible in lower left corner, now covered with white paint. 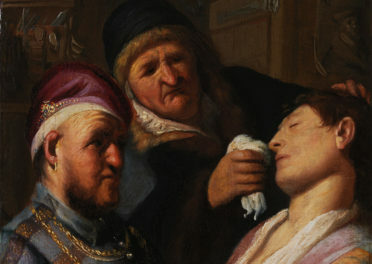 Due to the complexity of a painting structure, none of these examination techniques alone allows unequivocal identification of a binder, pigment, or varnish, nor a comprehensive understanding of the paint layer sequences in any given work. Hence every approach is combined with close visual examination under a microscope, pigment and binder analysis, paint cross sections, as well as information from other sources such as artists’ interviews and archival photographs. There is also the misconception, even among some art professionals, that scientific analysis is a straightforward process where a paint sample is simply inserted into an instrument (such as a Fourier-transform Infrared Spectrometer) and the resulting spectrum tells the scientist what the material is. In reality, analysis usually identifies several components present in a paint sample, consisting of a mixture of binder, pigment, and other additives, which requires the informed interpretation by conservation scientists and conservators. The same complexity applies to the interpretation of UV images because the multitude of layers and paint components interact and interfere with each other as they age. In addition, conservation treatments such as varnish removals/applications or retouchings can also leave traces that are visible under ultraviolet illumination. Retouchings and overpaint often appear as black areas, since the binding media have not yet aged as much as the original materials and since the conservation materials used differ from the ones found in the original. The ultraviolet image of Concreto 61, a work by Judith Lauand from 1957, shows such small black areas of retouching throughout the surface, some of them clustered around the edges where more paint abrasion is likely to occur. These small interventions by a conservator are nothing unusual for a painting more than fifty years old. The overall greenish fluorescence of the surface (and examination with a microscope) indicates the presence of an aged varnish layer, which seems to have been applied on top of an earlier campaign of retouchings, and as a result, they appear grey, rather than deep black. They are located primarily along the top edge and in the bottom right corner and probably contain titanium white, which also appears grey under UV. At an unknown date, Objeto ativo (amarelo) by Willys de Castro from 1959–60 sustained some damage in the right half of the painting. Top: Objeto ativo (amarelo), 1959–60, Willys de Castro (Brazilian, 1926–88). Oil on canvas on hardboard, 35 × 70 × 1.8 cm. New York, The Museum of Modern Art. Promised gift of Patricia Phelps de Cisneros through the Latin American and Caribbean Fund in honor of Lord and Lady Foster. Bottom: Objeto ativo (amarelo) under UV illumination. The two areas, one an oblong vertical shape toward the left and the other a small circular shape in the top right corner, were retouched very carefully in many parallel, horizontal strokes. 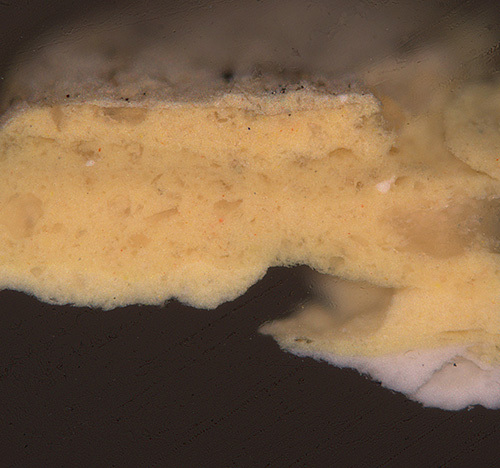 Paint cross section of Objeto ativo (amarelo), from top center edge of work, ca. 200x magnification. 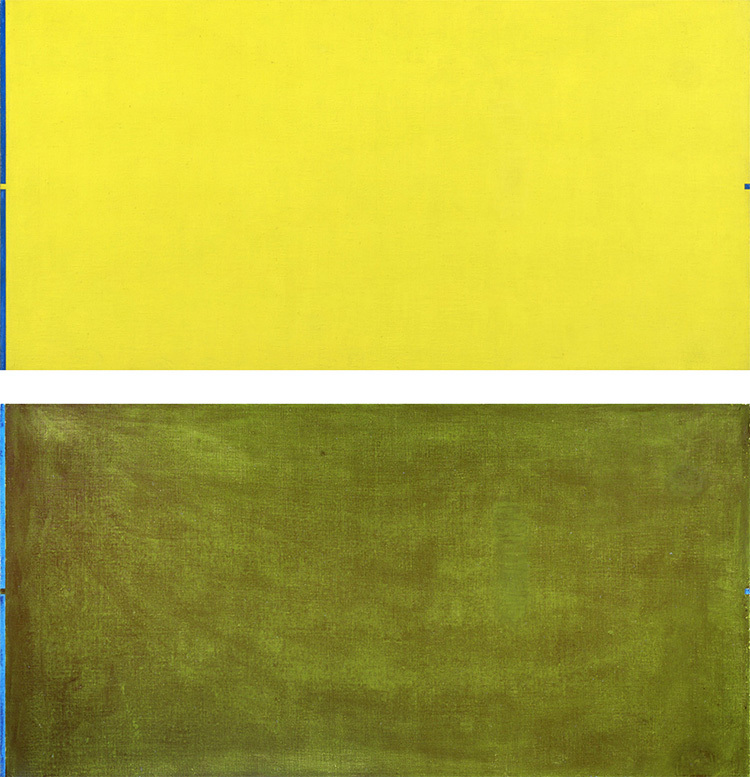 At the bottom is a white ground layer, followed by a homogenous yellow paint layer and above, at top, a more coarsely pigmented yellow paint layer. To the naked eye, they are only barely visible in raking light due to a slightly higher gloss in these areas. The entire surface was then repainted with yellow oil paint (linseed oil mixed with pine resin), which, based on its yellowish fluorescence, has already oxidized to some degree, although the fluorescence might partially derive from the original white ground and paint layers underneath, which are also based on linseed oil (but with no pine resin added). In order to better characterize the two yellow layers, a paint cross section was taken from the center top edge of the work. In Objeto plástico by Geraldo de Barros from 1952, the situation is somewhat more puzzling. Left: Objeto plástico, 1952, Geraldo de Barros (Brazilian, 1923–98). Alkyd on wood, 36.8 × 45.1 × 2.4 cm. Colección Patricia Phelps de Cisneros. Right: Objeto plástico under UV illumination. 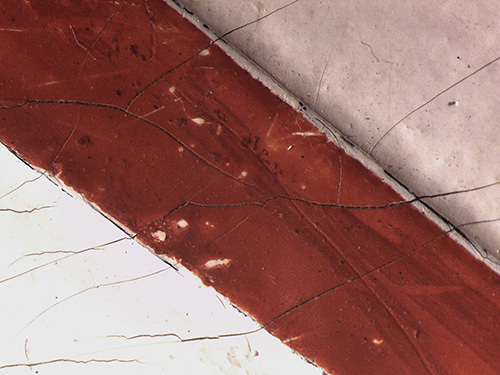 Photomicrograph of the red longitudinal shape in the center of Objeto plástico. The uppermost red paint layer sits on top of a white layer. Beneath the white layer a black paint layer can be seen in the paint cracks and along the edges of the form. The pigments of this work have not yet been identified in detail, except for the red paint, which is a synthetic organic pigment. The most striking green fluorescence of the black pigment is less straightforward to understand. There are no black pigments, natural or synthetic, which are known to fluoresce. Close examination with a microscope revealed that the shapes, all of which stand proud, were first painted in white, on top of the white background, followed by ochre, red, and black, however not in the current color scheme. Presumably dissatisfied with the initial outcome, de Barros added another white layer over the entire surface to provide a “blank slate” for the final color scheme, in which only the ochre parallelogram in the bottom left quarter remained the same color. The red shapes and ochre vector were initially painted black, and the now-black shapes were initially red. One of the underlying white layers, alkyd-based like the paint of the shapes, can be seen to strongly fluoresce underneath the edges of the uppermost colored layers, which very likely created interference with the surface layers. Based on the distribution of fluorescence in all of the shapes, my colleagues and I concluded that perhaps an additional dilute varnish layer was applied on top. This would also explain why the thinnest section of the black shape on the right does not fluoresce: the medium was not applied consistently. Left: Cromática 6, 1960, Aluísio Carvão (Brazilian, 1920–2001). Alkyd, drying oil, and beeswax on hardboard, 26.4 × 34 × 1.5 cm. Colección Patricia Phelps de Cisneros. Right: Cromática 6 under UV illumination. The final object, a work by Aluísio Carvão called Cromática 6 from 1960, displays a very interesting anomaly under UV. 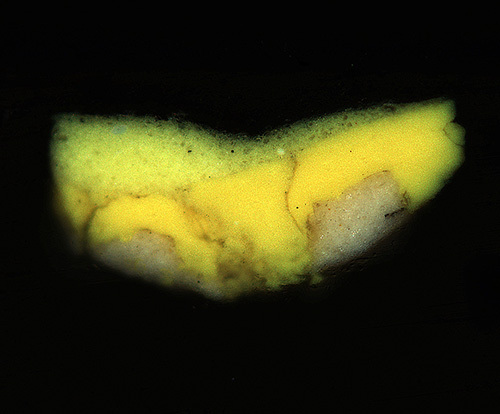 As can be seen above, there are a few small areas with irregular contours typical for liquids being splashed onto an uneven surface and that fluoresce a bright yellow under UV. Paint cross section of Cromática 6, ca. 300x magnification, taken from the top left corner. Above a white ground layer, five ochre-colored paint layers can be seen, packed with colorless extenders such as gypsum and barium sulfate and contain only a few pigments, but with high tinting strength, such as zinc chromate, titanium white, as well as chrome yellow and an organic yellow pigment. The uppermost, extremely thin toning layer contains primarily titanium white and gypsum. Scientific pigment analysis and cross sections show that the multiple paint layers are tightly packed with colorless extenders such as gypsum and barium sulfate and contain only a few pigments, but with high tinting strength, such as zinc chromate and titanium white, as well as chrome yellow and an organic yellow pigment. The uppermost, extremely thin toning layer contains primarily titanium white and gypsum. In other words, with the exception of the tiny amounts of yellow organic pigment present underneath, the rest of the pigments cannot be considered contributors to the localized fluorescence. But the matte paint itself, which consists of alkyd, drying oil, and beeswax and was presumably mixed by Carvão himself, is heavily underbound, meaning there is very little paint medium present relative to the amount of pigments. Because a hand-mixed paint is not as evenly dispersed as an industrially mixed paint, displacement and concentration of the oil components in the tide mark pattern indicative of a liquid state can happen more easily if, for example, a solvent is accidentally splashed onto the surface. 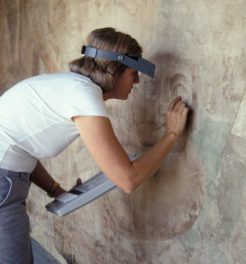 This speculation of how the tide marks might have been created is supported by the fact that these areas do not appear radically different from the surrounding paint surface under regular lighting conditions—in fact, only when one’s attention is drawn to them can these small areas be seen to be characterized by a slightly noticeable decrease in granularity, due to a temporary solubilization and redistribution of the paint matrix. We will never know exactly what or when this incident happened, but thankfully it does not detract in any way from the enjoyment of this beautiful, subtly wrought composition. The six examples discussed here present a variety of phenomena that only become visible to us by accessing the invisible parts of the electromagnetic spectrum. The resulting images greatly inform our understanding of the making and the history of a work of art, but their interpretation often requires the combined expertise of an entire group of conservation professionals. 1. Of the four bands of increasing energy, the long- or near-wave ultraviolet UVA radiation (320–400nm) is the most relevant for the examination of paintings. See Rhona MacBeth, “The technical examination and documentation of easel paintings,” in Conservation of Easel Paintings, eds. Joyce Hill Stoner and Rebecca Rushfield (Abingdon and New York: Routledge, 2012), 294. 3. E. René de la Rie, “Fluorescence of Paint and Varnish Layers (Part III),” in Studies in Conservation 27 (1982), 102. 4. The infrared image included in the exhibition catalogue on p. 92 was accidentally cropped, such that this earlier signature is no longer visible there. For an interpretation of what might have motivated Fiaminghi to overpaint the first signature, please refer to my essay “Making Concrete Art” in the exhibition catalogue. 5. Given the exceptional manual skills of Willys de Castro, it is possible that he himself carried out this repainting campaign. However, the fact that the upper yellow layer partially extends onto the blue square on the right-hand edge (illustrated in a photomicrograph in the exhibition catalogue, p. 52), would speak against such an interpretation, for the same reasons. 6. For a recent study of the fluorescence characteristics of azo and phthalocyanine pigments, see Martina Romani et al., “Hyperspectral Fluorescence for Organic Pigment Characterization in Contemporary Artwork,” in Journal of Applied and Laser Spectroscopy, vol. 1, no. 1 (2014), 29–36.